So, for the third time in four races this season it is Lewis Hamilton who leaves a grand prix circuit with a win and 25 world championship points. He now leads the way in the drivers' standings by 27 points from team-mate Nico Rosberg, which by any measure is a very nice cushion to recline on in the three weeks before the next race in Barcelona. Hamilton takes home the largest of the four trophies arrayed below, which bear more than a passing resemblance to the FA Cup it must be said. But that's another live page altogether. Thanks for being with us. We'll see you in Spain. Bernie Ecclestone's candid chat with Eddie Jordan provoked a response from many of you on Twitter earlier - and not a lot of it good. Speaking to BBC Sport, Nico Rosberg said: "It was very strange for my brakes to fail two laps from the end. I didn't even get a warning, it happened in the middle of my braking zone. I couldn't even see Kimi in my blind spot so maybe I could have defended into turn two so I had no idea where he was. After such an exciting race it was very disappointed. But that is the way it is and it is onwards and upwards and I am happy to have been able to pass the two Ferraris. "After such a disappointing start I was in full attack mode, I had to fight, I saw Lewis getting away and had two red cars in between I went for it and it worked out." Lewis Hamilton has been speaking to BBC Sport: "I felt quite comfortable, didn't feel under too much pressure from Kimi. I was feeling good then the brakes went long and I thought I had a brake failure, but I think Nico had something similar. I remembered a failsafe and that reset it, but I didn't push the brakes too much after that." On his plans before the next race in Barcelona: "I'm leaving in like half an hour or something, back to Monaco where I will spend a couple of days back at home and then I start work on Wednesday. I'm excited to get back to Europe and see Roscoe and my sister and my mum." Rachel T: Lewis looks like he is now off to win Wimbledon [he was decked out all in white post-race]. With his winning mentality, it could happen. Bathembu: I believe Ferrari is capable of It. Both drivers possess great pace and racecraft. They need a car equal to the W06. F1 Images: Lewis has great pace and determination, Nico has to come out with something else, today was a improvement from other races. With three wins in four races, Lewis Hamilton is very much hitting the 2015 season out of the park - and it seems he knows it. Today's race saw Kimi Raikkonen earn his first podium finish since the 2013 Korean Grand Prix. He also claimed the fastest lap of the race, the 41st of his career to tie with Alain Prost for second on the all-time list. Michael Schumacher leads the way with 77. Felipe Massa, P10 for Williams: "My car wouldn't switch on for the start, but then they changed a setting and it switched on. I started from the back of the grid and was gaining positions but unfortunately Maldonado hit my back in corner four and damaged something. It was a frustrating race." Team boss Christian Horner: "We are now on our engine limit. That's three engines in four races." Daniel Ricciardo's Renault engine exploded as he crossed the line today, and restrictions on the number of engines a team can use in a season is becoming a big concern for the team. Daniel Ricciardo, P6 for Red Bull: "I drove well but it was a bit of a lonely sixth place. I think the team is getting there we are getting there, making improvements. The top three teams are out of reach but coming into the European season and I think we will find a bit more. The biggest gaps have been seen and I think they will only get smaller." Eric Boullier, racing manager of McLaren: "We apologise to Jenson that we could not give him a reliable car. Hopefully for Barcelona we will have a new back end of the car and we can forget this weekend." Fernando Alonso, P11 for McLaren: "I have to be realistic and I am happy with the race today. We has concerns and you saw with Jenson who did not even start the race. I was important to finish the race and get some laps done. We have an important three weeks ahead to increase the performance and reliability. But to finish the race more less competitively is the best news of the day." Yesterday we asked you "what's up with Nico?" Today, because we're a contrary bunch, we're doing a U-turn and asking if he's got his mojo back after a battling drive today? Even if the answer is yes, is a fully-firing Rosberg any match for Hamilton, who stayed well away from the Rosberg-Ferrari squabble today and is now 27 points clear in the title race? And what of McLaren? We were more than sceptical of Alonso's claims that they'd be in the points by Barcelona, but boy did he show us. P11 today and upgrades to come for the next race. Can McLaren actually save their season? Get in touch using #bbc1 on any of these subjects - or indeed anything else that takes your fancy. Valtteri Bottas, fourth place: "It felt really good to keep Vettel behind me. Ferrari have a quicker car and he was closing quickly but I knew a few tricks to defend and that worked. "We have plenty of work to do. If we want to fight with Ferrari then we need more pace in the car. We need to push really hard and may be able to squeeze a few extra points." Special mention for Britain's Will Stevens, who finished well ahead of Manor team-mate Roberto Merhi. After having no pre-season programme, the team got both cars home today, with Stevens taking 16th place, more than 40 seconds ahead of Merhi. "I was disappointed for Nico this was the most racy he has been in Formula 1, wheel to wheel racing he was great today." QPR striker Charlie Austin on Twitter: Great drive by Hamilton but what a performance by Raikkonen. Force India on Twitter: Back to the points, with merit - one more step in the right direction. Great work by drivers, crew and team! Toto Wolff, Mercedes team boss: "It was a huge relief as both cars lost brake power. It was a shame for Nico he was having a great race and did some great overtaking. "We need to analyse the overheating problem. Looking at the result we were not dominant and Ferrari are catching up. We need to do everything we can to continue to beat them." Sebastian Vettel, fourth place: "I went wide on the last corner and damaged my front wing. I felt like I had less front grip and decided to pit which was the right call. It was a shame as I got stuck and could not get in front. "I feel like I let the team down a little when it was in reach. Kimi proved with second it is possible and he drove a good race. It would have been difficult to catch Nico and overtake as we were both on the same tyre and I had some damage to my front wing but I recovered well and got some decent points." Hamilton has become the fourth man to win back-to-back races in Bahrain. Fernando Alonso was the first man to achieve the feat with victories for Renault in 2005 and 2006, with Felipe Massa (below) following suit for Ferrari in 2007 and 2008, and Red Bull's Sebastian Vettel doing likewise in 2012 and 2013. Williams on Twitter: Sparks in the sky and on the race track. We like! Nico Rosberg, third place: "I enjoyed overtaking the red car, I liked that a lot. I couldn't catch Lewis as were were pretty similar as he pulled away and then I lost my brakes and went straight on two laps from the end and it cost me second place." Kimi Raikkonen, second place: "I am never happy when I finish second. After a difficult start of the year it as a good place to get some results and we came though very quickly in the end but unfortunately we ran out of laps. We have to be happy after the way we qualified and way we finished but we will be looking for better results. "Very happy with team to where we were last year, we have taken a big step and are working together in a good direction, we are improving as a tam and will be fighting for wins." Lewis Hamilton, first place: "Ferrari gave us a really good run for our money and we will need to keep pushing as a team. It was difficult to look after my tyres in the conditions. My brakes got a bit warm when I went behind a few back markers, there was no cool air coming in but it wasn't a problem." "Ferrari came off the back of a strong winter and you have got to be impressed by how quickly they have developed the car. If Mercedes don't react then they will be taken over by Ferrari." We'll have to make do with three-time world champion and 27-time race winner Sir Jackie Stewart. Of course a three-time champion is exactly what Lewis Hamilton wants to be come the end of this season. Not bad company to be in. Rosberg speaking to Raikkonen ahead of the podium ceremony: "I lost my brakes." Mercedes have confirmed that brake problems affected both drivers in the final couple of laps. A big scare for the world champions. Still, they made it home. "The iceman has driven brilliantly here to finish in second place, beaten Rosberg in a fair fight." Engineer to Nico Rosberg: Sorry about the brakes Nico, it happened at the worst time. So it seems Rosberg had a problem at the end there. A shame for him. Mercedes on Twitter: A heroic P3 from Nico - never backed down right to the flag. What a warrior! Fourth place goes to the Williams of Bottas, who drove well to keep Vettel behind him. Sixth went to Daniel Ricciardo, whose Renault engine expired in a dramatic plume of smoke as he exited the last corner but had just enough juice to get him over the line. Romain Grosjean takes seventh for Lotus ahead Sergio Perez, Daniil Kvyat and Felipe Massa. "Mercedes do not get the one-two but for Kimi Raikkonen it is his first podium for Ferarri since the Italian grand prix in 2009"
A little drama at the end there for Hamilton but he makes it across the line for his third win in four races this season and 36th of his career. Raikkonen takes second afte a fine drive in the Ferrari, while Hamilton's Mercedes team-mate Rosberg takes third. 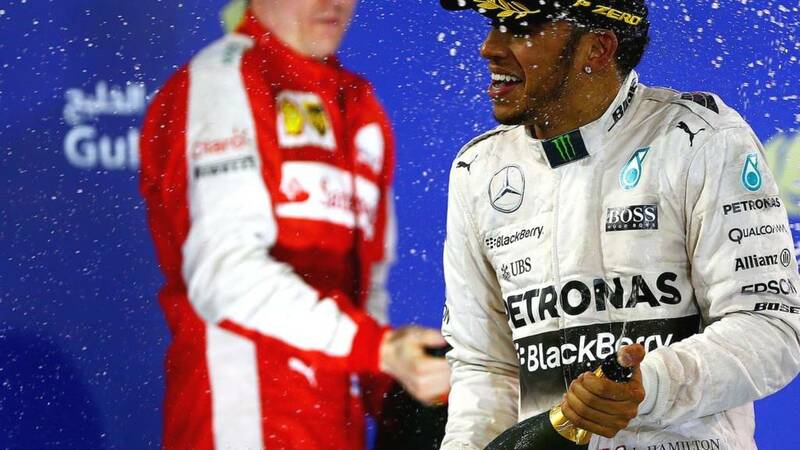 LEWIS HAMILTON WINS THE BAHRAIN GRAND PRIX. He's going at reduced speed and weaving a little. "Ferrari were just celebrating the pizza too early there, put it back in the oven there are two laps to go." A big mistake from Rosberg, running wide at turn one, allows Raikkonen into second place. Needless error from the Mercedes man and that is not going to do his fragile confidence any good at all. "How will the traffic hold up Rosberg? This is where you find out who you friends are." OK, it's been coming and now it's upon us. Raikkonen is right behind Rosberg. One second is the gap. He'll be able to use DRS on the next lap. Things getting a little fraught in the battle for fourth. Vettel slightly misses his marks under braking for the first corner and so nearly clunks the rear wing of Bottas. A lock up and a reflexive yank of the steering wheel averts the danger. Pat Symonds, Williams technical director speaking from the pit wall: "We are looking good at the moment for fourth place with Bottas. Vettel is on slightly fresher tyres, but not by a lot and we seem to be holding him. It is one thing to get up on someone and another to overtake them, We will fight till the end." Honda on Twitter: A sublime drive so far by Alonso and he's currently P11. "This has been another brilliant display from Hamilton, he has been superb this year. Winning the second title last year has put him on another level." Hamilton looks set for victory, but it's anyone's guess for second place. Raikkonen is now just 3.7s behind Rosberg. Another 1.1 taken out of the Mercedes on that last lap. Raikkonen is now within five seconds of Rosberg in the battle for second. His advantage on those tyres is dwindling but he's still pulling out a second a lap. Vettel's nose change has put him behind the Williams of Bottas, who is not in the mood to give up fourth place lightly. With seven laps to go these guys look set for a battle to the flag. Kimi Raikkonen: "Come on, the blue flags. They just don't move those people." "It's 26 races since Kimi Raikkonen has stepped up on the podium." Nico Rosberg: Please don't tell me the gap anymore! "Lewis Hamilton's advantage looks pretty secure at this stage as he looks for his third victory of the season." Mercedes on Twitter: And sure enough, the Iceman is lighting up the time screens in an ominous shade of purple. Come on Nico - hold on son!! Nico, Kimi is coming to get you. With 11 laps remaining the Ferrari man has got the gap down to 10 seconds. Will those soft tyres continue to give Raikkonen a performance advantage all the way to the flag? "Raikkonen's going to come at the Mercedes like a hot knife through butter." Engineer to Nico Rosberg: "We think Kimi is a threat and is forecast to catch you before the end of the race." Raikkonen is taking great chunks of time out of Rosberg in second place. The gap has come down from 19s after the last pit stops to around 13s now. Hamilton is five seconds ahead of Rosberg. Cameron: Tell you what, Nico has definitely showed that he can race today. Three overtakes on Vettel. Roth: So it looks like if Kimi gets on the podium he'll be doing it despite Ferrari rather than with Ferrari. Steve Roberts: Alonso must be kicking himself when he sees Ferrari doing well, must be more to it. Can't understand why he would leave. "Maldonado stops for the pit lane limiter and locks the rear axle, maybe in that scenario it switched the engine off." Maldonado's car appeared to stall as he just entered the pits for a stop, and he coasted into his box. The Lotus was sat for a long time while the mechanics tried to get the car restarted, and all the while thick smoke was pouring from his overheating brakes. He's away again but his hopes of a points finish has gone. "Because of the traffic Hamilton has dropped off by half a second." Hamilton leads the way by 4.5secs from Mercedes team-mate Rosberg. "Raikkonen is going for the option tyres for the last stint of the race he will be able to hit his tyres hard and go flat out. Can he start to close the gap on Rosberg?" "Ferrari should have made this pitstop for Kimi Raikkonen much, much earlier." OK, he's in and Raikkonen is going to have 17 laps to tear up a new set of soft rubber. He's well clear of Vettel in the race for third, but can he claw back any time on Rosberg's Mercedes. "Looks like another issue for Raikkonen, doesn't seem to be just the tyres. Looking at Ferrari pit box they are not moving looks like are going to leave them out for another lap." The slowing Raikkonen is now passed by Hamilton for the lead. Why are Ferrari not bringing him in? Raikkoen needs to get off those tyres! McLaren's Fernando Alonso has just unlapped himself. "That pit stop really counts against Vettel getting a podium today and Mercedes like the look of that. But Ferrari still have Raikkonen who is racing against Rosberg for second place." Max Verstappen has pulled into the garage and that is both Toro Rossos out of this race. New front wing for Vettel - this is his podium finish over then - long stop. Alex: The pit stops now are insanely fast, Vettel's stop looked almost instant. Jeremiah Kariuki: This must be killing Alonso inside. That he cannot race and is a backmarker, just there to let others overtake at will. Olivia Fahy: Can you guess who this house is cheering for? I think I'm in the wrong house (no offence Lewis Hamilton). Sebastian Vettel: "Think I have some damage on the front wing - don't know why. Keep an eye on the sensors please." Damage for the Ferrari after that mistake in the final turn. He's in for a new nose and his victory hopes are over. Between the Mercedes and Raikkonen now. "This is one of the best displays of racing ability from Rosberg for sometime." Rosberg has passed Vettel again but he got a helping hand from his fellow German. The Ferrari driver ran wide through the final turn and it was easy for the Mercedes man to pass down the straight. Rosberg pits - and Vettel does the undercut again! A sense of deja vu at he front as Vettel again undercuts the Merc of Rosberg in the pit stops. The Ferrari man set the fastest lap of the race on fresh tyres to get the job done. Very much the hallmark of a four-time champion. "Raikkonen has matched lap for lap the pace of Hamilton who is at the front." Lewis Hamilton is on the medium, as he needs to be. He rejoins a few second up the road from Vettel. Rosberg leads now from Raikkonen, who is still very happy on those medium tyres. He's been on the radio questioning why the team is going to put him on softs at his final stop, but his team assures him it's the right move. "You could see sparks on the front left wheel of Sainz, maybe the wheel nut was not seated correctly." The Ferrari man now is on the medium tyre and with 24 laps remaining he's on a run to the flag. Toro Rosso's Carlos Sainz has just pulled off with what looked like a wheel problem following a pit stop. "Feeling something strange in the car," the Spaniard tells his team on the radio. Possible finger trouble in the pit stop? They may only have one car in the race but McLaren are doing OK - relatively speaking. Fernando Alonso is battling with Saubers, Force Indias and Williamses in the low teens, and on a two-stop strategy too. He's been told to expect to be racing the three-stoppers again come the end of the race. Pat Symonds, Williams technical director, speaking from the pit wall: "Massa has a problem. He was hit by Pastor Maldonado early in the race and has got some floor damage which was confirmed at the pit stop. He is struggling on down force at the moment. "Our target is fourth place, but with the way Raikkonen is going on the prime he has a performance advantage on us." Jenson Button on Twitter: Seems like low degradation on the second set of tyres for most, option or prime. Lotus on Twitter: A nice quickie for Pastor means a couple of places gained - crowded exit. We've just seen a replay of Vettel running wide at the end of the back straight. More encouragement for Raikkonen running behind. Jenson Button on Twitter: Great pit lane action between Maldonado, Massa and Nasr. Hamilton leading by 2.5secs from Rosberg, with Vettel 3.5 further back. Raikkonen, on the medium, is 6.5secs behind his team-mate. The two Felipes are having a good scrap for 10th place. The vastly less experiences Nasr gets the job done in the Sauber, but the two men are immediately into the pits for their second stops. They pitted with Pastor Maldonado behind them - but the Lotus mechanics do a brilliant job and the Venezuealan gets the jump on both Nasr and Massa as they exit. "Under three seconds between the top three, 20 laps completed and nothing much to choose between them." "I think the top three are tripping over each other. And that's why Raikkonen is gaining on the harder tyre." Not sure how, given the medium tyre looked around two seconds slower than the soft in practice, but Kimi Raikkonen has been gaining time on the top three, who are all on softs. Not what was predicted but there you have it. He'll be on softs later when the others are on the medium. Definitely a man to watch. Edward Williamson: If Ferrari are faster on the Mediums, Mercedes have had it. Simon Partridge: How dangerous is the pit lane at Bahrain? Rosberg and Vettel only needed to be 0.5s earlier! Loving the close racing though! Jamie Robinson: Kimi could be a dark horse here on a different strategy. Raikkonen is on the medium tyre, whereas the front three of Hamilton, Rosberg and Vettel are on the softs. He lost a lot of time still running around on his old softs after the front three had put on fresh sets. Being on the mediums is not going to see him close in anytime soon, but will he be able to come back into play later in the race? "Rosberg is aggressive yet assured that is what we wanted to see last year. People mature at different rates but this is a great display from Rosberg this afternoon." The Finn is back out again just in front of Bottas. He's fallen away from the front three during that first round of stops. Jenson Button on Twitter: I think all the fast cars going 3stop, Only person in top 10 going for a 2 is Perez. Hamilton has a slowish stop - 3.7secs - and comes out JUST in front of the battling Rosberg and Vettel, the Mercedes man overtaking the Ferrari down the pit straight. Rosberg gets the pass done as the pair charged down towards the first turn, where the re-joining Hamilton was just getting up to speed. On Pastor Maldonado setting the fastest lap of the race: "It shows the difference between a new set of options. He doesn't get the chance to finish many races so he has to go for it when he has the opportunity." Lap 15 and Rosberg is in, and he comes out BEHIND the Ferrari of Vettel. The undercut gets the job done for Ferrari. "Attack him now in fresh tyres," is the message from the Mercedes pit wall to Rosberg. 2.4secs stationary for Vettel. His team-mate Raikkonen was right on his tail so when the Finn stops they will be scrapping for track position. Lotus on Twitter: First stop for Pastor - with a little added linger. Maldonado had to serve a five-second penalty during his pit stop. Jenson Button on Twitter: Kimi is the man to watch, looking after his tyres well. Felipe Massa is coming up nicely through the field after his formation-lap bother. He's just passed Felipe Nasr's Sauber for 14th. That Williams is comfortably the third quickest car so Massa should be worth watching as he comes through the pack. Kimi Raikkonen is keeping Sebastian Vettel more than honest here. The Finn could well get the jump on the four-time champ in the pit stops. Ok, lap 11 and the drivers are coming in for their first stops. Hamilton leads by 5.368secs from Rosberg. Rosberg is up to second but my word Vettel did not make it easy for him. They both braked incredibly late for turn one but the Mercedes man had the inside line. Good pass. He came from a long way back to get that done. Mercedes from Mercedes, Ferrari from Ferrari. Lotus driver Pastor Maldonado was indeed out of position on the grid and he'll be getting a five-second penalty. "Mercedes are looking stronger than Ferrari at this part of the race." Mike Bird: This is a proper race! Jeremiah Kariuki: Rosberg seems to have learnt a few tricks from Lewis! A nice pass and defence over Kimi! Time to take the fight to Vettel now. Rachel Marshall: Ferrari have worked hard over the winter. Good to see some fight & competition during the races so far this season. Lap eight and Rosberg is getting racy. He's just had a real lunge at Vettel but the Ferrari man shuts the door. At this rate, and with DRS, it's only a matter of time surely. An early stop for Max Verstappen in the Toro Rosso. He had some front-wing damage after that early tangle with Maldonado. Engineer to Nico Rosberg: "We need a little bit of brake management before you attack Vettel". A moment for Lewis Hamilton into turn four. He runs wide, allowing Vettel to close in but the Mercedes man keeps the position. Hamilton, Vettel, Rosberg, Raikkonen, Bottas, Ricciardo, Grosjean, Hulkenberg, Ericsson, Sainz. Great stuff from Nico Rosberg. He sweeps past Rakkionen into the first turn at the start of lap four and he's back into third. Hamilton still leads by around two second from Vettel. The Lotus man being investigated for being out of position on the starting grid. Mercedes on Twitter: It was a bold move from Nico but just didn't pay off. He's got work to do now, but we know he's not shy of a bit of graft! #GoNico! "Rosberg tried to go aggressive on Vettel but Raikkonen read that. Rosberg is the loser at start of this grand prix"
"Maldonado a little bit all over the place on this opening lap," says BBC commentator Ben Edwards. Toro Rosso's Max Verstappen has just radioed to say he has had contact with the Lotus man. Hamilton holds lead through turn one but it's a bad start for team-mate Rosberg, who loses a place to the Ferrari of Raikkonen. Sparks and dust are flying everywhere! Ok, an 18-car grid forms up. Button out, Massa in the pits. What next? The Toro Rosso driver will serve a five-second penalty at his first pit stop for "exceeding the maximum time" on his recce lap to the grid. And a car is left behind! It's the Williams of Felipe Massa! Gutting for the Brazilian. The entire bid streams past and instead of starting sixth Massa will be starting from the pit lane. His engineer Rob Smedley says it's an electrical problem. Jenson Button on Twitter: As you probably are aware I will not be taking part in the Bahrain GP, the guys have worked flat out to get the car built but we're unable to run. Carl Rahn Griffith: Good grief, even Manor can get 2 cars on the grid. What an utter embarrassment McLaren has become. They need Ross Brawn. Party Bob: The whole event has been diabolical for JB... Let's hope the upgraded car gets him smiling again in Barcelona. Guppster: After what they put JB through last year and they give up on his car that easily. Sunset in Sakhir is at 18:03 local time. The lights are on and the first night race of 2015 is just about ready to go. Jenson Button will not start for McLaren. McLaren on Twitter: Sadly we are not able to ready Jenson's car. During fire-up, data indicated an issue originating from his earlier electrical problems. "It has been another character-building weekend for Red Bull. Daniel Ricciardo qualified seventh again - that seems to be about their position at the moment, with the Renault engine still lagging well behind those of Mercedes and Ferrari - and while the Australian has hopes of taking the fight to Williams, he knows it will not be easy. "Meanwhile, Daniil Kvyat's nightmare start to his career with the senior team continues. The Russian failed to make it out of first qualifying and seemed a bit perplexed afterwards about why. A couple of hours after qualifying he was saying something vague about 'a few energy issues', admitting they 'needed to understand it deeper'. "Kvyat has the pace and talent but some people who have worked with him feel the promotion to a team as demanding as Red Bull may have come a year or so too soon. He may well be looking at the three-week break before the next race in Spain as a chance to reset and take stock of what has gone wrong for him so far in 2015." Mercedes driver Nico Rosberg, third on the grid: "I have to put the setbacks behind me and move on full attack today. I have an awesome car so even when I am not having a great day I am starting third. I have the opportunity at the start and will try and go around the outside. "I need to be aggressive I can not afford to be safe starting third I have to go for it." "In China last weekend, the Williams drivers split the Ferraris on the grid, only to lose position on the opening lap after a brilliant double pass by Kimi Raikkonen, and then lose touch thereafter. "In Bahrain, Valtteri Bottas - the quicker Williams driver this weekend - was just 0.154secs from pipping Raikkonen again. Another lonely race appears in prospect, though. Head of performance engineering Rob Smedley admitted Williams still 'need a bit more performance out of the package to fight with the cars in front.'" Mercedes head of motorsport Toto Wolff: "There is a real threat from Ferrari, they have improved a lot over the winter. They need to be taken seriously. The old days of having a solid gap and running away with the race are over." The official F1 website is reporting McLaren's Jenson Button will not start this race. We'll bring you confirmation when we have it. "This is expected to be a two-stop race. Three stops is about the same overall speed but the chances of getting caught in traffic and your pace ruined are too great for most to try it. The key thing in terms of the lead battle will be the 'undercut' - or the prospects of a driver close behind trying to jump the one in front by stopping earlier and taking the benefit of fresh tyres. This is likely to be Ferrari's big tactic against Mercedes. "An aggressive two-stop could feature a first pit stop as early as lap 12. That commits the driver to a long middle stint on the soft tyres, which would likely not be a worry for either Sebastian Vettel or Kimi Raikkonen but may be a concern for Mercedes. If Ferrari try that, do Mercedes respond to keep track position and try to manage their tyres from in front or stick to their optimum race strategy? "The favoured tyre strategy is soft-soft-medium, leaving the medium - which has a lower optimum working temperature - until later in the race when track temperatures will be at their coolest and therefore most suitable." Diggrich: Not fair. It leaves a sport only to the richest people, not to the ones that love the sport. Lucy Carr: What a joke without the smaller teams you wouldn't have a race. Manor is a great team. Perhaps it's time for Bernie to go. Go Manor. Peter Taylor: A lot of people don't want Bernie in F1 either. Maybe he should go too. "About whom is Lewis Hamilton most concerned - Sebastian Vettel or Nico Rosberg? "'Your biggest rival is always the person who's closest to you,' Hamilton said, 'even more so with Sebastian because it appears they were quicker on their long runs than we were. So I know I am going to have my work cut out to try to stay ahead while looking after the tyres and make them go the distance and I don't know how much he is going to be on my tail. It might be cool to control it after the first corner. "'In Malaysia we thought we would be ahead and we ended up behind. In the last race we thought they would be much stronger but they were no problem for me. in this race we think they will be strong and we don't know how it will go. but I hope it's the way I want it to go. I won't know until I get around the first corner.'" Michael Schumacher won the inaugural Bahrain Grand Prix for Ferrari on 4 April 2004. The victory was the 73rd of Schumacher's career his third in as many races at the start of the year. He would go on to win 12 of the first 13 races of 2004 on his way to his seventh and final world title. The first corner at the Sakhir track was named in honour of Schumacher in early 2014. BBC's pit lane reporter Tom Clarkson reports that another problem has been found with the McLaren of Jenson Button, which has suffered three failures already this weekend - the one in qualifying yesterday caused a fire in the car. Clarkson says McLaren boss Ron Dennis "is very unhappy with the situation and it's very understandable". We'll have more news for you when we have it, but Button's car, cordoned-off in the garage, doesn't look like it's going anywhere. "While last year's Toro Rosso driver Daniil Kvyat struggles following his promotion to Red Bull, the two men who hope to follow in his footsteps continue to impress. This weekend, it was Carlos Sainz Jr's turn to make his mark. The Spaniard has been overlooked a little for his 17-year-old team-mate Max Verstappen so far, but Sainz has always been right there with the Dutchman - they are tied on six points and it is two-all in qualifying - and in Bahrain he was well ahead, in ninth on the grid with Verstappen down in 15th. "'I feel very happy,' Sainz said. 'Probably it was the least expected Q3 of the year. I even thought this was going to be the toughest and most difficult to achieve after what we had seen in FP3... But we did a mega turnaround and we went for it. Everything worked out and I'm very satisfied with the result.' Verstappen had no excuses, simply complaining about excessive understeer on his car." Stephen D'Albiac: Given the choice of Manor, a team of racers, or a manufacturer who will pull the plug when it suits them, I'll take Manor thanks. Alex Davenport: To say you don't particularly want a team in F1 is terrible. He should be grateful teams want to compete! Dave Highkinen: I agree that the engines are far too expensive. They're going to get even worse in 2017 if this 1000bhp change goes through. F1 supremo Bernie Ecclestone was very uncomplimentary about Manor in his interview with Eddie Jordan, saying he didn't particularly want the back-of-the-grid team in the sport. Ecclestone was annoyed by the team's failure to race at the first race of the season in Australia and has threatened to withhold prize money from the team as a result. Manor team boss Graeme Lowdon had this to say in response: "With greatest respect to Bernie Ecclestone the message we get is the fans want us here. "Bernie and our team have the same objectives to contribute to Formula 1, we want to contribute more and when we are at a stage to do that I think he will feel differently. "We had a difficult end to last season and a difficult start to this season. People were right to be sceptical before Melbourne but we are here to stay and want to push forward." was flipped over following a collision with the Lotus of Pastor Maldonado. Maldonado was coming out of the pits on lap 40 and heading into Schumacher corner when he smashed into the side of the Mexican, sending his car into a barrel-roll. Gutierrez emerged unharmed from the incident while Maldonado was given a warning and handed a five-place grid penalty for the next race in China. Ferrari driver Sebastian Vettel, second on the grid today, tells BBC Sport: "A win would be nice. We have a plan for the race but in the end we will race as hard as we can. "Fairly soon in the race we will find out how quick we are compared to Mercedes. They are the favourites but if we can give them a hard time that would be nice." "McLaren have made no attempt to disguise the fact that they have been having a difficult start to their relationship with new engine partner Honda but there has been steady progress at every race and finally in Bahrain that led to a major breakthrough - Fernando Alonso got the car into second qualifying for the first time this year. And while Pastor Maldonado and Daniil Kvyat both had problems, this was no fluke - the Spaniard had the car a stunning ninth fastest in first qualifying. "He could not sustain it in Q2, though. Despite improving his time by 0.2secs, the McLaren-Honda was at the mercy of the other teams turning up their engines. Nevertheless, 14th on the grid is still a major achievement at a track on which McLaren were expecting to be a struggle. "Jenson Button has had a nightmare weekend so far, with problems stopping his car in first and third practice and again before he even managed a lap in qualifying. He starts last." Force India's Nico Hulkenberg will start from a season-best eighth place on the grid. And from that position there is every chance the German could be right at the sharp end into the first turn if recent history is any guide. Hulkenberg has gained places in 11 of his last 12 standing starts, and on six of those occasions he's gained four or more places on the first lap. Definitely a man to watch when the lights go out. "We have seen the emergence of Ferrari which everyone wanted to see, it was real in Malaysia and it is real here This is going to be a huge race. "Nico Rosberg has dropped away, he is not the force he was last year. " The 2010 Bahrain Grand Prix was the first race to award points all the way down to 10th place, and the first to award 25 points to the winning driver. Ferrari's Fernando Alonso was the first to benefit to the full from the change, trousering a quarter-century of points for his victory in the season opener. At the other end of the scale, Force India's Vitantonio Liuzzi and Williams driver Rubens Barrichello were the first to be rewarded for finishes outside the top eight, earning two points and one point for finishing ninth and 10th respectively. "More on Bernie Ecclestone's interview with BBC Sport. On the German Grand Prix's absence from the calendar, Ecclestone says he gave the organisers every opportunity but could not get a deal together. And on a persistent whisper that Audi are keen to come into F1 but that chairman of the board Ferdinand Piech will not allow it while Ecclestone is in charge, Ecclestone says that he had not heard that, but if Audi did want to come in and would not do so while he was boss, he would step down straight away. Not many people in F1 would believe that, it has to be said." Tony Stewart: Hamilton, Vettel, Raikkonen. Ferrari gonna show what they can do today, Rosberg will crack under their pressure. Fred Owen: Mercedes will run away with this one, its a night time race and 10 degrees cooler. Tyre wear won't play into Ferrari's hands. Russell_Premier: Vettel, Raikkonen, Hamilton - tyres are going to be a big influence today! "The state of F1 has been a key subject within the sport for several months, and this weekend F1 commercial boss Bernie Ecclestone has given an interview on the subject to BBC F1 chief analyst Eddie Jordan. "It will be part of the build-up on BBC One from 15:00 BST but, in a nutshell, Ecclestone says F1 has lots of problems that need sorting out, the biggest of which is that it is too expensive. He adds that the governance is too democratic (obviously wishing to be its 'benevolent' dictator even more than he already is), and he continues to question the current V6 turbo hybrid engines, saying they were designed by engineers and they are not what the manufacturers want. The Lotus driver lines up 16th on the grid after a power issue in Q1 yesterday. Poland's Robert Kubica claimed his only F1 pole position at the 2008 Bahrain Grand Prix. The BMW Sauber outpaced that year's title protagonists Lewis Hamilton and Felipe Massa to top spot but was beaten off the line by the Brazilian Ferrari driver, who went on to win the race. Kubica had to settle for third place. Kubica's F1 career came to a premature end weeks before the start of the 2011 season when he suffered a partially severed arm in a rallying accident in Italy. "Mercedes' fears about Ferrari centre on two things - Sebastian Vettel's victory in Malaysia three weeks ago; and the highly impressive pace set by the red cars on their race-simulation runs in second practice on Friday. "Vettel was more than a half a second a lap on average faster than Rosberg on similar tyres. Mercedes think they know why - they had their tyres out of their ideal operating window, with a temperature imbalance between the surface and the core of the rubber. "'We have corrected quite some things looking at the deficit on Friday but we didn't have the time to test it properly,' team boss Toto Wolff said. 'I think we made the right developments to get the tyre in the right window but the ultimate proof we will have tonight.'" Sensible parenting. Always buy clothes with plenty of growing room. "As at most weekends so far this season, Kimi Raikkonen has been right on Ferrari team-mate Sebastian Vettel's pace in Bahrain; in fact ahead as often as not. But also as in most weekends so far, Vettel was ahead when it mattered in qualifying. "Raikkonen said he felt in hindsight he could have pushed a bit harder than he did but the Finn does at least have the consolation of being fourth on the grid. "'The aim is to be at the front,' he said, 'so we know we still have work to do. I'll take this rather than fifth or sixth place. I'm kind of happy, there were no big issues, and at least we're further up and can fight.'" More chin-stroking facts can be found here. James Allison, Ferrari's technical director, has been chatting to BBC Sport about the team's hopes for the race. "The plan is to win clearly, we are on top of one another on the grid so it is going to be exciting, I am not sure which way it will go," he said. "It is a very rough track, the asphalt is rough and warm. The rear tyres will get stressed by a track like this. How they run over the course of a stint is very important. "Most races are settled before the last stint but there are several scenarios where they are fought down to the wire. Kimi can win, him and Sebastian both had good pace on Friday, it is anybody's race." You've already been getting in touch with your predictions for this race. Keep them coming using #bbcf1. Farhaan: Hamilton easy win, Rosberg will come close but will be too much in his head to allow Vettel 2nd. Tom Morgan: I'm going bold. Vettel/Raikonen/Hamilton in that order. If not I still think that will be the top 3. "The concern at Mercedes about Ferrari's potential for this race is palpable. Lewis Hamilton might be on pole after another highly impressive qualifying performance, but beside him on the front row is Ferrari's Sebastian Vettel - and Nico Rosberg shares the second row with Vettel's team-mate Kimi Raikkonen. "How close it is going to be, team boss Toto Wolff was asked? 'Close,' he replied. 'That is what we must get used to. We are not caught by surprise any more. So it is going to be a tight race.'" The sun may be going down in Bahrain but it's very much coming up on Lewis Hamilton's bid for a third world drivers' title. Two wins from three races at the start of the season and seemingly well on top of his team-mate, it already looks like this championship race is Hamilton's to lose. He starts today's race from pole, half a second clear of his pursuers, and on the evidence of the season so far it's hard to look too far beyond the Briton for the 25 points today. What a great picture this is. Manor's Roberto Merhi blasting through the multicoloured patchwork backdrop of the Bahrain International Circuit during third practice. Take a good long look, though, because those sun-enriched reds, blues, yellows and whites won't be displayed in quite the same way when the fourth round of the 2015 season gets under way at 16:00 BST. Instead, today's action will play out under some 5,000 lights, held aloft by 495 lighting poles and powered by more than 500km of electric cable. The upshot? One of the most visually arresting races of the season.